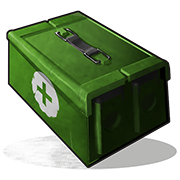 The large medkit is a seldom used 'upgrade' to the medical syringe. It can regenerate a player to full health over time, but provides no instant health bonus like the syringes it is crafted from. This item is rarely used in combat as any incoming damage will stop the healing process. Many players use it to heal after failing radtown jumping puzzles as they are mainly found in radtowns. It serves its purpose as a very expensive, but useful alternative to the Bandage. Large Medkits have an instant usage which stops any bleeding that you have, which can save your life. Useful for instantly recovering health from a just ended fight or a near-fatal fall. It is not wise to use this instead of a Medical Syringe in cover after taking damage in a firefight, you'd be left with very low health if your enemy decides to rush to your position, so it's better to take a few stacks of Medical Syringe along to counter the downsides of the Large Medkit. If you're going out on long trips, to raid and or to counter raid, it is recommended to bring this if you want to be brought back to full HP in tight combat situations. 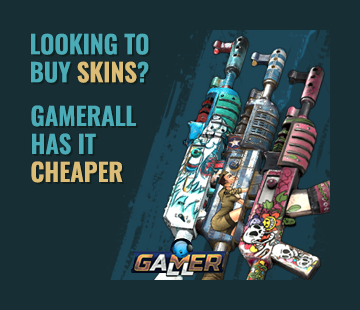 It is suggested that you at least bring 1 or 2 incase of death and having the enemy loot them from you. It has a slow healing time so use it carefully.